A Snap to Open! a Snap to Close! A snap to use! Banners are a very popular way to communicate to customers in a store. Our Grip-Tite™ banner hangers can be seen in use at every kind of retail outlet from department stores to dollar stores. The point of purchase is the last and best chance in the consumer purchase cycle to capture the attention of the target. Use wall mount sign holders such as these banner hangers from Clip Strip Corp. to make a statement at retail. We have a very large assortment of sign and banner holders, plus display materials; you can count on us to be your trusted vendor for all your POP needs. 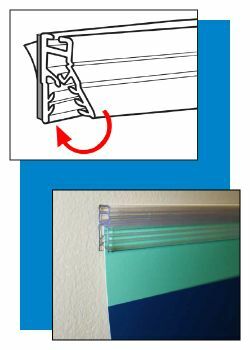 Minimum quantity for "3" Galactic Grip-Tite™ Banner/Sign Holder w/ Adhesive, GGB-720" is 100. Minimum quantity for "24" Galactic Grip-Tite™ Banner/Sign Holder w/ Adhesive, GGB-721" is 100. 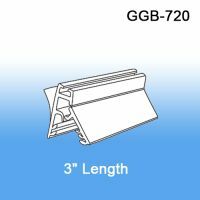 Minimum quantity for "36" Galactic Grip-Tite™ Banner/Sign Holder w/ Adhesive, GGB-722" is 100. 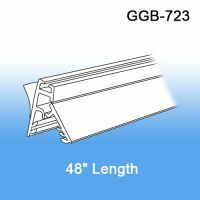 Minimum quantity for "48" Galactic Grip-Tite™ Banner/Sign Holder w/ Adhesive, GGB-723" is 100.